While setting up network for KVM virtualization, it is necessary to setup a network bridge. 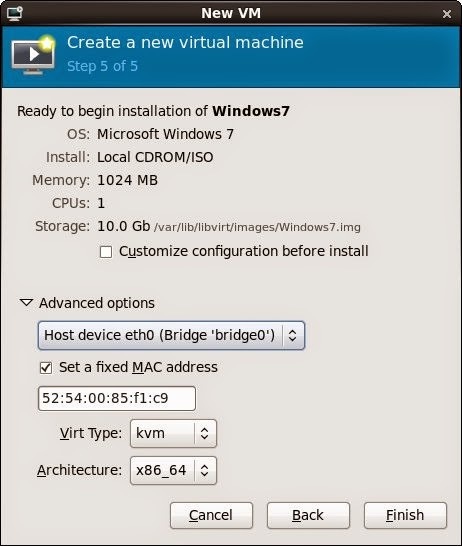 The virtual machines, must be connected to the network bridge created on the host machine. By doing so, the guest machines will share the physical network of host machine. The network bridge makes the VMs to behave as standalone servers. Now, make sure no ipaddress,gateway,netmask is mentioned to the physical interface of the server. Let us assume physical interface is "eth0". Now, restart the network using "/etc/init.d/network restart". This will bring up bridge network "br0". When this option is selected for a virtual machine it will have access to the external network using the same eth0 device used by the host.